Does Hoover WindTunnel 3 Pro Live Up To Expectations? Hoover WindTunnel 3 Pro is a bagless upright pet vacuum cleaner designed to deep-clean virtually all floor and above-floor surfaces with no loss of suction thanks to its unique multi-cyclonic technology. It is a product of Hoover, a renowned US company that has been around since 1907. Keeping in mind its relatively low price, Hoover WindTunnel 3 Pro offers quite a lot, with its powerful motor, great surface compatibility, strong suction, handy attachments for pet hair removal, and HEPA media filter. Find out if it is the right fit for your vacuuming needs in this complete Hoover WindTunnel 3 Pro review. 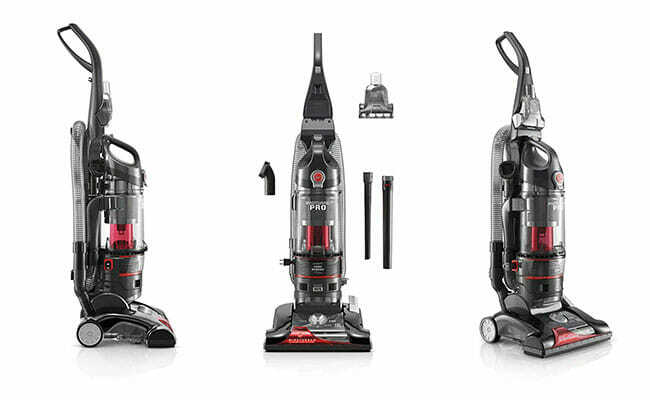 Hoover WindTunnel 3 Pro is a sleek pet vacuum with a color scheme dominated by black and metallic red. It is a bagless upright with an easy-to-empty dirt cup. It is a bit heavy, which is not unusual in uprights, and its large dimensions require a lot of storage space. The absence of a swiveling head does not help with maneuverability, but the vacuum is still rather easy to use. As far as buttons and switches go, Hoover has opted for some smart solutions like an easy-to-reach power button near the top and appropriately labeled height adjustment levels. Handy pedals allow you to recline the vacuum and turn the brush roll on an off in a single step. The soft wheels allow for smooth movement and the ergonomic design does not put a strain on your back while vacuuming. View the table below for more concrete details on Hoover Wind Tunnel 3 Pro technical specifications. If you are looking for a pet vacuum cleaner with many bells and whistles, Hoover WindTunnel 3 Pro may not entirely fit the bill. However, it does have more than a few attractive features that make it both convenient and efficient. Here is what this eye-pleasing pet vacuum has to offer feature-wise. Multi-cyclonic suction minimizes power loss and uses fast air rotation to increase and facilitate dirt and hair pickup. Thanks to this powerful technology, Hoover WindTunnel 3 Pro does not suffer from major fluctuations in suction and consistently provides a thorough clean. 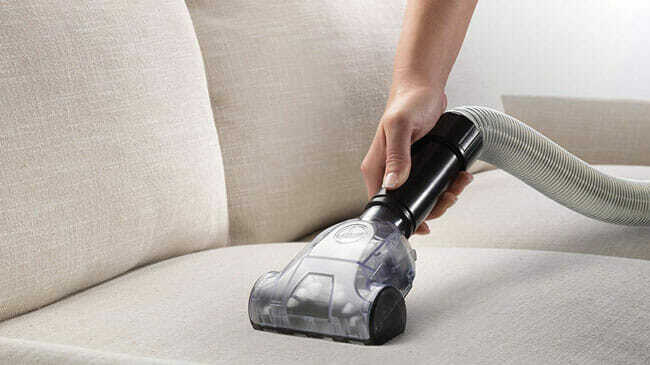 Hoover’s proprietary WindTunnel® 3 technology creates 3 channels of suction, thus enhancing the device’s vacuuming reach. It allows the vacuum to pick up even deep-embedded dirt and pet hair, which is of particular use in high-pile carpets and upholstery. 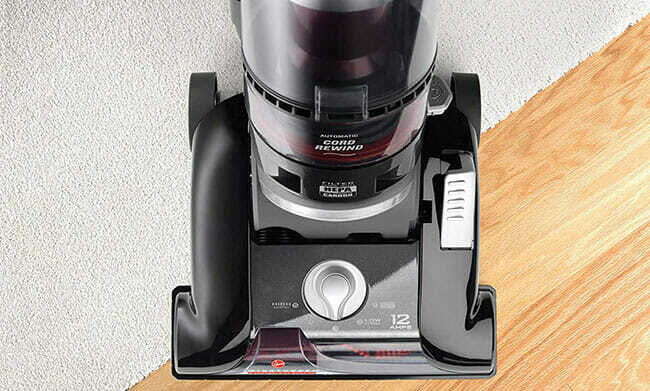 With a convenient brush roll switch that lets you turn the brush roll on and off simply by stepping on a pedal, Hoover WindTunnel 3 Pro lets you transition from carpets to bare floors and vice versa with absolute ease. This handy pet vacuum does not only help you quickly collect pet hair from all kinds of floors and carpets, but it also provides handy tools for above-floor cleaning. You can use it to clean anything within a 12-foot reach, such as drapes, windows, ceilings, fans, and various hard-to-reach spots where pet hair tends to accumulate. With a 5-level height adjustment, you can clean everything from hard floors to high-pile carpets. Picking the right height level may require some experimenting, but the convenient labeling around the control switch can be of great help. Multiple height options at your disposal mean more efficient cleaning across different carpeted surfaces. HEPA media filter provides truly powerful filtration, capturing 99.97% of dirt, dust, and pollens. It catches tiny particles down to 0.3 microns, which allows it to efficiently trap allergens and prevent them from escaping the vacuum. Hoover WindTunnel 3 Pro features a particularly convenient bottom-release dirt cup that can be emptied with a simple push of a button. While this may not seem like a huge deal, it does help you avoid contact with dirt and it may encourage you to empty the dirt cup more frequently, as all you need to do is hold it over a trash bin and push the button to get rid of the dirt. Manually wrapping the cord is not only boring, but it can also cause cord damage. With automatic cord rewind, the cord is neatly stored within the vacuum in seconds – and just like with the dirt cup, your only job is to push the button. Hoover WindTunnel 3 Pro comes with 3 handy on-board attachments. It features crevice, turbo, and dusting brush tools, all of which perform important functions in pet hair elimination. The crevice tool can be used to clean cracks, crevices, and other small spaces that are impossible to reach with other attachments. These are the spaces that often go neglected and they are notorious for health-threatening dirt and hair accumulation, which makes the crevice tool all the more valuable. The turbo tool is particularly useful in cleaning upholstery, mattresses, stairs, and even clothing. It can extract deep-embedded dirt and hair from materials of different textures and depths. The dusting brush tool can be used to clean fans, vents, bookcases, shelves, and other surfaces, smooth or ornate, efficiently eliminating dust without scratching. The vacuum also comes with a telescoping extension wand that extends the vacuum’s cleaning reach to 12 feet. As suggested previously in this Hoover WindTunnel 3 Pro review, this pet vacuum cleaner is designed for effortless room-to-room cleaning, providing great performance on various surfaces due to its powerful suction and handy attachment tools. We will now focus on its performance in the most common vacuuming scenarios, including bare floor, carpet, upholstery, and stair cleaning. Hoover WindTunnel 3 Pro is well suited for all types of bare floors, from tiles and linoleum to hardwood floors. It features soft wheels and brush roll switch-off, so it is safe to use on quality flooring. Its strong suction lets you easily pick up pet hair and particles of different sizes, usually in a single pass. You just need to be sure to choose the hard-floor height adjustment setting and turn the brush roll off, and you should have clean, scratch-free floors in no time. When cleaning carpets, you should turn the brush roll on for optimal results. 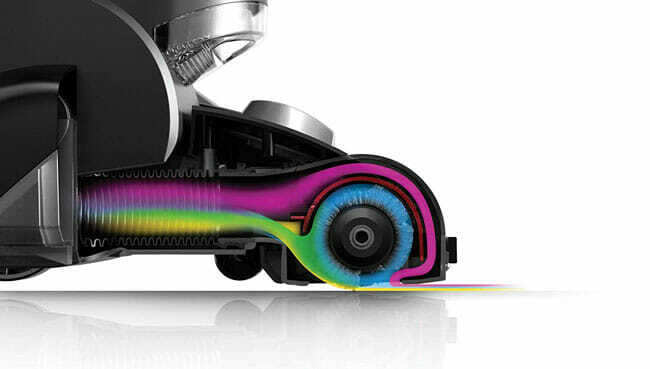 Due to the unique technology it employs, which targets deep-embedded dirt and pet hair, Hoover WindTunnel 3 Pro does a better job cleaning high-pile carpets than most similarly-priced vacuums. However, it is important to note that the results greatly depend on the height adjustment settings. If you are not entirely satisfied, freely experiment with different height levels to identify the one that works best for your carpets. In upholstery cleaning, the selection of adequate attachments is crucial. You can use both the dusting brush tool and the turbo tool, but keep in mind the two attachments target different types of dirt. With the turbo tool, you can efficiently remove pet hair and tiny particles stuck inside the upholstery while the dusting brush tool is better for surface cleaning. For optimal cleaning results, we recommend using the dusting brush tool first and then removing the remaining, more stubborn dirt and hair with the turbo tool. Hoover WindTunnel 3 Pro can be particularly handy in carpeted stair vacuuming, as long as the staircase is not too tall. The turbo tool should be your attachment of choice. The process is simple, requiring you to lift the vacuum by the stair cleaning handle and clean forward to back. The only problem is that the vacuum’s maximum cleaning reach is 12 feet, which may not be enough in all cases. When researching for this Hoover WindTunnel 3 Pro review, we were most pleasantly surprised by the vacuum’s price. You can get Hoover WindTunnel 3 Pro pet vacuum for just $89.99, with all accessories included. Shipping is free of charge for all orders within the US, including Hawaii and Alaska. The vacuum comes with a 2-year limited manufacturer’s warranty. The warranty exclusively covers original defects in materials and craftsmanship and it is only applicable if the product has been used and maintained in accordance with the Owner’s Manual. Hoover WindTunnel 3 Pro is sold via Amazon and it comes with Amazon’s standard 30-day money-back guarantee, which mostly applies to new and unused products. User experiences with Hoover WindTunnel 3 Pro tend to differ significantly, although the general consensus is that this pet vacuum is powerful, convenient, durable, great for pet owners, and rather fairly priced. However, the vacuum is not without flaws, which include occasional hose clogging and frequent belt replacements. Some users also complain about fragile plastic elements that may break after many uses, particularly if the attachments are changed frequently. Another common complaint is that the vacuum tends to overheat easily. While this is not untrue, it is usually the result of irregular maintenance. If the vacuum is maintained as recommended in the Owner’s Manual, with the filters, hose, and brush roll cleaned frequently and properly and the dust cup emptied regularly, overheating is not an issue. To conclude, Hoover WindTunnel 3 Pro does suffer from some minor problems, but there are few that cannot be solved with proper maintenance. It produces expected hair removal results, it can last for years, and it perhaps costs less than it is worth. At the end of this Hoover WindTunnel 3 Pro review, we can say with certainty that with this vacuum, you get what you paid for. While it is not the most powerful pet vacuum cleaner we have reviewed and while potential issues are not non-existent, its consistently good performance and equally good price make it a solid choice. Thus, if you are looking for a budget-friendly solution to your pet hair troubles, Hoover WindTunnel 3 Pro can fit both your needs and your budget, as long as you do not mind doing some light maintenance every now and then. Our ratings are the result of an objective and independent evaluation of Hoover WindTunnel 3 Pro, generating the final rating that reflects the overall quality of the company. Ratings may change as the service changes. Hoover WindTunnel 3 Pro user rating based on 2 user reviews. If I wanted to clean hoses this often, I wouldn’t have become an accountant. It worked fine for the first couple of months, but now the hose is constantly clogged, I have to clean it at least twice a month, I’m not happy! It’s been more than 2 years since I bought mine and it still works great. You have to clean it often, sure, but that’s what you should do with all vacuums if you want them to last. We found 0 verified Hoover WindTunnel 3 Pro discounts for April, 2019. There are no Hoover WindTunnel 3 Pro coupons or discounts right now. If you like Hoover WindTunnel 3 Pro but aren’t sure whether they are truly the ideal choice for you, you may want to take a look at our comparisons below to discover if one of their competitors is more suitable for you. All content featured on BestPetVacuumCleaners is the result of continuous research conducted by independent reviewers with extensive experience. Our pet vacuum reviews, comparisons, and guides are designed to help you avoid marketing traps, identify differences between seemingly similar pet vacuums, and consequently make a safe and educated purchase decision. We introduce you to tested and proven solutions that can truly make vacuuming a breeze and keep your home clean and hair-free. We never recommend pet vacuums that we did not, do not or would not use at our own homes.